Huge David Beckham fan? Porsche 911 Turbo fanatic? Perhaps both? 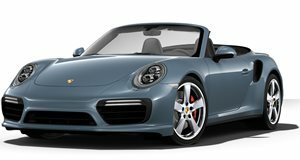 Back in 2008 David Beckham bought this Porsche 911 Turbo Cabriolet for $145,000. And even after just a couple years of usage, the 911 is now on sale on a eBay for a never mind the car&apos;s depreciation price of $143,100 (according to the latest bid at the time of this writing). Beckham and his wife, a one Posh Spice, drove the car around Beverly Hills for only two years, with a total of just 6,774 miles on the odometer. And because someone like David Beckham wants to make his Porsche extra special, the football/soccer star added customized wheels, headrests, and floor mats all decorated with his LA Galaxy number: 23. He also added a Techart exhaust system. And no, 23 is not stamped into the metal. The famous couple also recently sold their TVR Cerbera, but they have reportedly decided to keep their Bentley Continental Supersports, so don&apos;t feel too bad for them.